Visits: 41487 persons viewed this recipe. Though an adapted dish, cutlet now has a unique position in the Indian cuisine. Ease of preparation and variety in experimenting with our ethnic taste, makes this dish dearer to food lovers. Inspite of having a lot of nutritional values, some may be allergic to this bundle of proteins. So do take care about the health factors while trying this egg cutlet recipe. Pressure cook potatoes by adding salt and enough water to cover it. Mash it and keep aside. Chop ginger, green chillies, shallots and curry leaves finely. Heat 1 table spoon cooking oil in a pan and put finely chopped ginger, green chillies, shallots, curry leaves and a little salt. Saute till golden brown. Break 4 Eggs and pour it into the roasted mixture. Stir well and roast it. Add salt to taste. Remove from the flame and mix it well (using hand) with the mashed potatoes and pepper powder. Make small balls with the mixture, press to make it as a round shape and keep aside. Dip each ball in the beaten egg (remaining 1 egg) and roll it on the bread crumbs. Pour enough oil into a deep bottom pan and heat it. When the oil is hot reduce the flame to medium and deep fry the egg cutlets by turning both sides. Serve hot with tomato sauce and onion salad. 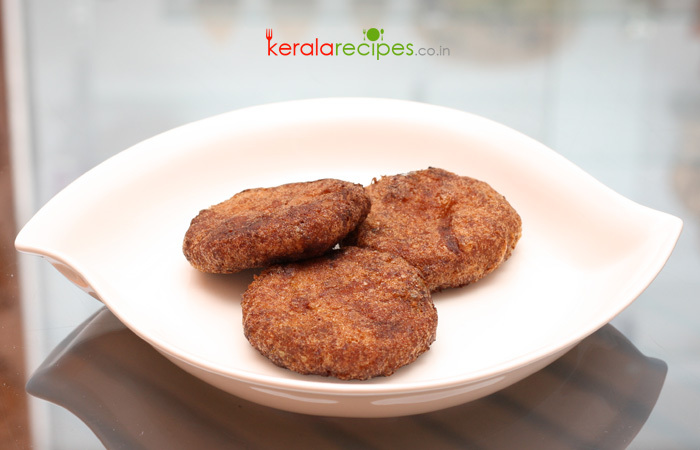 Refrigerate the cutlet mixture (called keema) for 1 day before frying so that the cutlets won`t break. It is unbelievable, I never had this, now I am going to make this. Thank you Meena, Hope you will like the Egg cutlet. very very nice, I never had this, I like it. Hi Bincy, Thank you so much for your kind words. I am happy that you liked it. Hi, Your recipes are ultimate. I have tried some. I always used to have the same cutlet in hotels outside. Never knew how to prepare it at home. Thank u for such a good recipe. Please post some more non veg dishes of Kerala. I like Kerala dishes a lot. Hi Ashu, Thanks a bunch for your nice words of encouragement also for leaving your feedback here. It is a great pleasure to know that you tried Egg Cutlet and it came out well for you. Definitely I will be posting more non-veg recipes in the near future. Thanks again for such wonderful feedback. Mouth watering recipe. I want to try this. One small doubt. Is it deep fry or shall I try with pan with little oil? Hi Vasantha, Thank you very much for your nice words. You can deep fry or shallow fry (frying in a pan by adding a little oil) it. I tried this last Sunday with pan. My kids loved it. Thank you. You are welcome Vasantha. It is pleasure to know that your kids loved it. Thanks for trying this recipe and also for leaving your feedback here. I am a cutlet lover, but never had this. I will surely make it..
Hi Shani, Thanks for the comment. Please share your feedback if you happen to try this recipe. Hi Shaan thank you so much for this recipe.. now my three year old daughter starts to eat egg. Dear Shaan, Thank you so much for this recipe. I never had this. but I will try…. thank u again for this new idea….. Regards, Vincy. You are welcome Vincy. As you said it is a new idea. Hope you will like it. Please let me know your feedback. Am going to make it for the 1st time… hope my hus like it. Thanks for this. Will definitely try. I have never come across this site before, today by mistake I opened it & you won’t believe it, I liked all the recipes & today itself I am going to try two recipes. I have prepared egg cutlet before but this seems more easier and tasty. Please do post some more egg recipes. Thanks & Regards, Reena. Hi Shaan, I loved this recipe. Please have some more variety of food. Linu, Thanks for the feedback. I will try to add more varieties. Hi Sir, thanks for giving a different type cutlet recipe it was really tasty & yummy. Welcome Shankar Thanks for the feedback.